The Pet Store, pet shop and dog grooming. Pickering, UK. All your pet needs under one roof from feed to bedding. 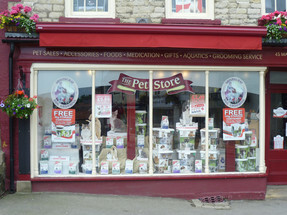 A traditional pet shop in recently refurbished premises providing food, treats, medication and accessories for all pets. A full dog grooming service is also offered within the premises. Inside the brightly decorated shop you'll find an aladdin's cave full of all you will ever need for your pet, and more, together with free local deliveries to your doorstep!